New South Wales (NSW) has recently become much more welcoming for first home buyers. 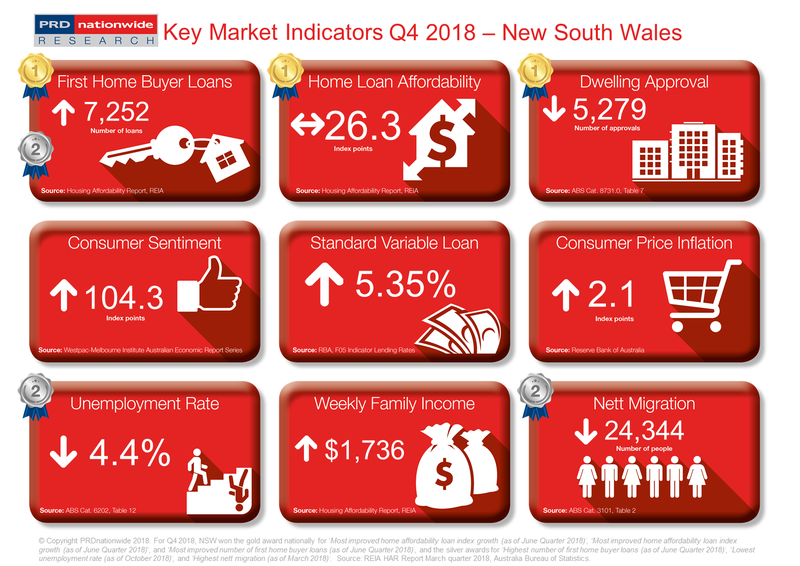 In the June quarter 2018, the state achieved the gold award nationally for the most improved number of first home buyer loans with a 68.8% increase over the past 12 months. It also achieved the silver award nationally for the highest number of first home buyer loans (as of June quarter 2018) with 7,252 such loans issued. This has been driven in part by being the only state to not decline in affordability over this period, helping it achieve the gold award nationally for the most improved home affordability loan index growth (as of June quarter 2018). Another notable achievement for NSW was winning the gold award nationally for the highest number of dwelling approvals (as of September 2018), making it a top performer with 5,279 approvals. This rate was -16.7% softer than the period 12 months prior (September 2017), which is indicative of the cooling being experienced within the wider property market, largely lead by Sydney. That said, nett migration operated at a similar softer rate of -15.1% across the 12 months prior to March 2018, which will lead to a balance in supply and demand. This will achieve a more sustainable rate of property price growth in the long run. NSW had a low unemployment rate of just 4.4% this quarter, awarding it the silver award nationally for lowest unemployment rate (as of October 2018). This was an improvement on the rate achieved 12 months prior, suggesting that employment conditions remain strong. Further, the state won the bronze award nationally for the highest median weekly family income growth (as of June quarter 2018), at 2.4%. Combined with a low unemployment rate, this places NSW as a leader in the market, with strong underlying economic fundamentals.